Composed by Jan Nigro with GoldStar Magic™ creator, Terry Nicholetti, and sung by the Vitamin L Children’s Chorus, with special guest, jazz singer Peggy Haine. We invite you to download this song. To do so, right-click here, (for Mac, Control-click) and choose “save link as….” Then save the music file to your computer. You’re welcome to add to your mp3 player and/or burn a CD. We’d love you to share this song! Welcome! So happy to share the Ifwee Song with you! You and your family will have so much fun listening (and dancing!) 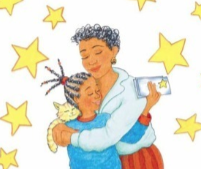 to this delightful song that tells the story of GoldStar Magic – care first, then act, then share your story! Thanks so much for joining NoraLee's Readers! We hope you enjoy the Ifwee Song. If you already own the book and kit, we thank you! If you’d like to know more about these wonderful Family Communication products, we invite you to visit the “GoldStar Magic™” page on this site by clicking here.